Unique Festival Reveals its Full Programme! With over 100 workshops and events, RawFfest youth arts festival opens in just one week. Running from 17 August to 20 August in Llandudno, the festival is open to all 14 to 25 year olds. This is the only national UK festival programmed entirely by young people for young people and its exciting line up reflects the passions of the young curators. There are many opportunities for young people to take part, learn something new and meet other like-minded young people. This year the festival includes 4-D theatre, acrobatics, art installations and exhibitions, beatboxing and rapping, blogging and self-publishing, body art and festival headwear, book illustrating, a chill-out tepee, a circus cabaret, craft workshops, dance and drama workshops, a design competition, environmental art on the beach, fashion show and up-cycling workshops, film making and screenings, a mini folk festival, interactive scavenger hunt, hula hoops, hovercraft making and science communication, live music and jamming sessions, a music industry panel, the Narnia writing den, newsFfest streaming live through the festival, opera, opinions and debate, a poetry slam, punk poetry, radio station and broadcasts, screen-printing, a silent disco, site-specific and immersive performances, stage-lighting workshops, songwriting, story-telling, theatre shows and a twmpath. There will also be a residency from National Youth Theatre Wales including voice, singing, movement, devising and audition techniques. The programme is available online at www.RawFfest.wales. Tickets are £10 or £20 for a day and £50 for the whole weekend which includes lunch and dinner. Tickets can be booked online 24/7 atvenuecymru.co.uk. After ticket purchase, buyers receive a unique code to enable specific workshops to be pre-booked. Abbie Parry, Aled Petrick, Amelia Stars, Andy Bonsai, Anya Sims, Burst Publishing, CEG, Conwy Youth Services, Criw Celf, Theatr Clwyd Company25, Dawns i Bawb, Ella Louise Jones, Emma Louis, Frân Wen, Gemma Lyon, Gweni Llwyd, Hannah Willwood, Jain Boon, Jake Evans, Jess Williams, Kiani Marie, Llŷr Alun Jones, Menai Rowlands, Mess Up The Mess, Mr Phormula, Natasha Borton, NYTW, Operasonic, Penygraig Youth Theatre, Peter Slania, Rhian Sullivan, Rhydyfelin Youth Theatre, Richard Elis, Rowen Kimpton, Sera Owen, Sophie McKeand, Tara Williams, Techniquest Glyndŵr, Tim Pugh, Tonya Smith, Torch Youth Theatre, trac, TV Conwy, Volcano Youth Company, and Wales Millennium Centre. The festival has received financial support from the Arts Council of Wales and the Welsh Government. 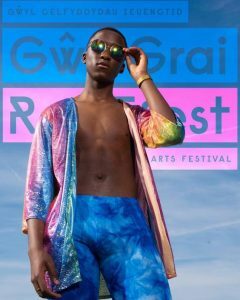 For additional information and the programme go online to www.rawffest.wales.